If increasing muscle mass is one of your goals, then think twice before you go out for a night of heavy drinking. Consuming alcohol in large quantities has a direct effect on your metabolism, causing fat to be stored instead of being utilized as an energy source. Alcohol contains seven “empty” calories per gram, meaning that these calories don’t provide you with any of the essential nutrients you need to build that muscle mass you desire. Alcohol is a known depressant that suppresses the brain’s ability to function. Even though you may feel a “high” after several cocktails, the truth is that your reaction time, accuracy, balance, hand-eye coordination and endurance all decrease dramatically. 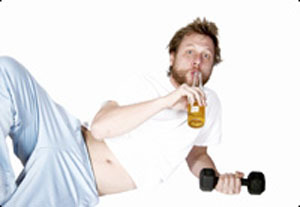 Furthermore, the after-effects of a night of excessive drinking can be detrimental to your fitness goals. Alcohol is a diuretic that may result in dehydration. This dehydration is known to decrease physical performance, so that previous night of drinking will continue to affect you the following day. Alcohol consumption can cause sleep disorders by disrupting the sequence and duration of sleep states and by altering total sleep time and the time required to fall asleep. It is popularly believed that a drink before bedtime can help a person fall asleep. However, alcohol’s affect on sleep patterns results in increased fatigue and physical stress to the body. Therefore, alcohol consumption indirectly affects a person’s strength-training ability due to increased fatigue and a lack of healthy reparative sleep. Alcohol inhibits the breakdown of nutrients into usable substances by decreasing the secretion of digestive enzymes from the pancreas. Regular alcohol consumption also impairs nutrient absorption by damaging the cells lining the stomach and intestines and disabling transport of some nutrients into the blood. In addition, nutritional deficiencies themselves may lead to further absorption problems. For example, folate deficiency alters the cells lining the small intestine, which in turn impairs the absorption of water and nutrients, including glucose, sodium and additional folate. Such interference of nutrient breakdown and absorption may impair the physical performance and recovery required to build and maintain muscle mass. Many people under the influence experience “drunk munchies” that can result in the consumption of several hundred extra calories for the day. A study examining how alcohol affects caloric intake found that subjects who drank wine with their lunch consumed an additional 200 calories and did not compensate for those calories by cutting back at dinner.